I created a few Pure Data abstractions for mapping pd knobs within a patch. 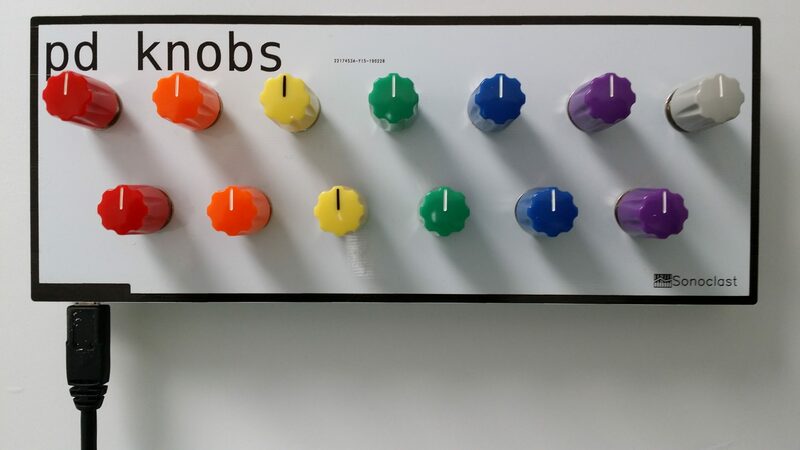 “pd_knobs_127” outputs the raw MIDI CC values from 0-127. “pd_knobs_1” outputs those values scaled (divided by 127) from 0-1. And “pd_knobs_1_sig” outputs the scaled values as audio rate signals, which is appropriate for use with Automatonism, for instance. pd knobs is built around a Teensy LC, and its code is open source. The knobs numbered left to right are programmed as MIDI CC numbers 102-114, but they could easily be customized by modifying the source code snippet shown below. // Map MIDI CC channels to knobs numbered left to right.